GREENSBORO — Fourth- and eighth-graders in Guilford County Schools are performing better than, or as well as other large city districts nationwide in math and reading, according to a report released today. The report reveals the results of the 2017 National Assessment of Educational Progress, or NAEP. Considered “the gold standard” in educational testing, the assessments are the largest and most consistent measures of student knowledge across school districts and states and over time. Although every state administers NAEP assessments, GCS is one of only 27 districts nationwide that are part of the Trial Urban District Assessment, or TUDA program. The district joined TUDA in 2015, and students took the NAEP assessments when administered in 2017. With these results, GCS now has district-level data for the first time. Guilford County Schools, the third largest school district in North Carolina, the 47th largest of more than 14,000 in the United States, and serves more than 73,000 PK-12 students at 126 schools. Guilford County Schools Superintendent Sharon L. Contreras says the district can now compare its performance with that of students across the state and nation. She also says these results provide the district with good baseline data, which can be used in coming years to measure progress. The 2017 results show that in both math and reading, GCS fourth-graders performed as well as their peers in public schools nationwide and better than students in other large city schools. GCS eighth-graders are performing as well as students in other large city districts in reading and math, but lower than their peers in public schools nationwide. Reading and math scores for GCS’ fourth- and eighth-graders rank among the top 10 districts nationally. Guilford County Schools’ students also performed well in comparison to students across North Carolina. Scale scores for GCS were virtually the same as scores for NC students in Grade 4 Math, Grade 4 Reading; and Grade 8 reading. Grade 8 Math scores for GCS were lower than those posted by students statewide. GCS also fared well when compared to North Carolina’s other TUDA district, Charlotte-Mecklenburg (CMS) in reading. Both Grade 4 and Grade 8 Reading scores for GCS were the same as scores for CMS. However, CMS students outperformed GCS in both Grade 4 and Grade 8 Math. In fourth grade math, GCS students had an average score of 240, outperforming large city districts and 20 other TUDA districts. GCS student scores matched students in North Carolina and public schools nationally. In fourth grade reading, GCS had an average score of 222, higher than large city schools and 20 other TUDAs, and the same as students in North Carolina and public schools nationally. With eighth grade math, GCS had an average score of 276, outperforming 16 other TUDAS, the same as large city districts, and lower than students in North Carolina and public schools in the nation. For eighth grade reading, GCS averaged 260, which was higher than 14 other urban districts, the same as large city districts and North Carolina, and lower than public schools nationwide. “Clearly, we have more work to do, but I’m pleased by our baseline scores,” said Contreras, noting that the district had already started addressing lower math performance by selecting a new curriculum and materials for the 2018-19 school year. The district also is investing more resources in professional development for teachers. NAEP results in GCS, and across the country, show achievement gaps between students of color and white students. 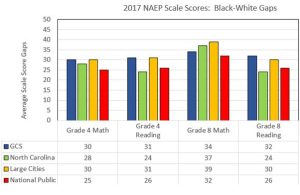 Black-white score gaps for GCS fourth-graders are similar to or less than gaps in large cities, but greater than gaps for North Carolina and public schools nationwide. For eighth grade math, GCS black-white score gaps are the same or lower than gaps in large cities, North Carolina and public schools in the nation. GCS black-white score gaps in eighth grade reading are larger than the other three groups. Scores for white and Latino fourth- and eighth-graders in GCS reflect similar gaps. These findings confirm that decreasing the achievement gaps between students of color and their white peers should be a district priority, says Contreras. Goal V of the district’s strategic plan is to decrease the achievement gap between black and Latino students and white students by 7 percentage points. Currently, the gap ranges from 25-37 percentage points in reading and math, depending on grade level. 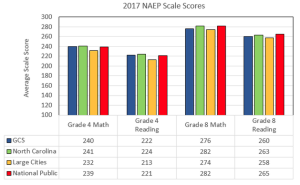 NAEP is administered every two years and scores are reported to identify national and state trends and to highlight performance of large urban school districts. Approximately 3,500 fourth- and 3,400 eighth-graders throughout GCS were randomly selected to take the hour-long tests in math and reading. As a TUDA district, GCS is now able to track progress, identify opportunities for improvement and pinpoint specific curriculum needs based on student performance and feedback after taking the tests. GCS was among six new school systems to join the TUDA program. Other newcomers include districts in Denver, Milwaukee, Fort Worth, Memphis and Las Vegas. Michael Casserly, executive director of the Council of the Great City Schools, applauded the district for its inaugural performance.